candy pieces, and a creamy bit inside. 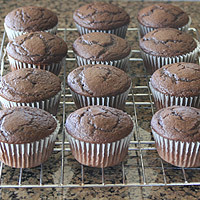 This recipe is best with the chocolate cake recipe, but for cupcakes I usually use a box mix. 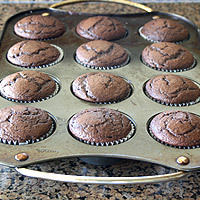 Cupcakes tend to dry out quickly, so if they aren't going to be eaten within a few hours of baking them it's not worth the trouble of making the cake from scratch. Make a box cake batter according to the directions on the box. Bake until just the center springs back, but just slightly. Let cool 10 minutes in the pan. Cut the butter into 2-3 tablespoon pieces. Bring to room temperature or slightly colder. Set aside. 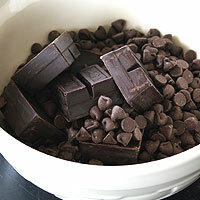 Melt chocolate in the microwave for one minute. 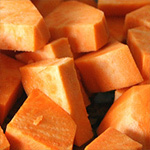 Stir and microwave an additional 30-60 seconds. Stir until smooth. Set aside to cool slightly. Put an inch or two of water in a large pot. Bring to a boil, then reduce to a simmer. 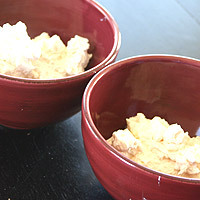 In a large bowl add the egg whites, sugar, cream of tartar, and salt. Whisk well. 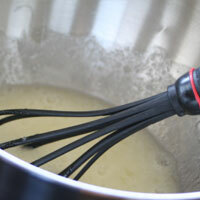 Place over the simmering water and whisk constantly. 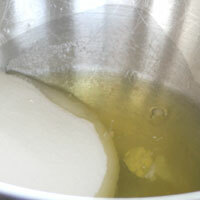 Heat to 160 degrees (about five minutes) The mixture should be doubled in volume and frothy. Beat on high speed for five minutes until stiff peaks form. Reduce speed to medium and add the butter one piece at a time until each is incorporated. Add the vanilla and beat until incorporated. Divided the buttercream in half. Add the melted chocolate to one of the halves and the peanut butter to the other. Cover and store at room temperature until ready to use. 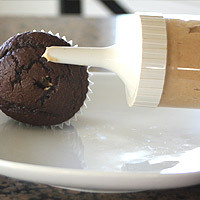 Fill a frosting tube with the peanut butter buttercream. Using the bismark tip insert it about half way into the cupcake. 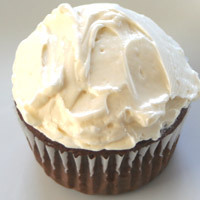 Press in buttercream until the cupcake swells slightly. Remove the tip and repeat with remaining cupcakes. Top with peanut butter buttercream. Top with peanut butter cup pieces. Fill a frosting tube with the vanilla buttercream. Using the bismark tip insert it about half way into the cupcake. Press in buttercream until the cupcake swells slightly. Remove the tip and repeat with remaining cupcakes. refer to chocolate cake or buttercream recipes for problems with those. 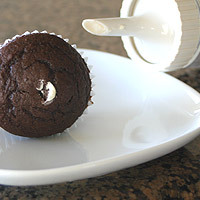 Melted Buttercream: make sure the cupcakes are completely cool before frosting them or the buttercream will melt. 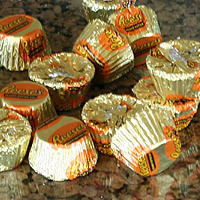 Peanut Butter Cups: For a nice presentation chop the peanut butter cups carefully so they look sharp and not mushed. If they are too soft refrigerate them first. 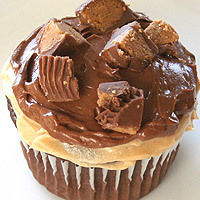 Chocolate Buttercream: It's a bit hard to spread the chocolate buttercream on top of the peanut butter cream without mixing them. You can pipe it on and spread it carefully or just spread it carefully. 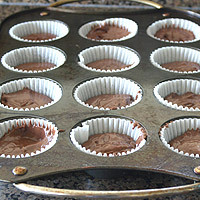 Prepare and bake the chocolate cupcakes according to the instructions. Let cool 5 minutes in the pan then move them to a cooling rack to cool completely. 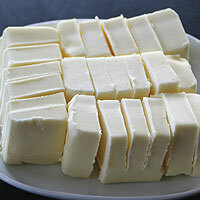 Cut the butter into 2-3 tablespoon pieces. Bring to room temperature or slightly colder. Set aside. 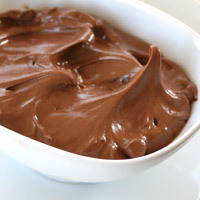 Melt chocolate in the microwave for one minute. Stir and microwave an additional 30-60 seconds. Stir until smooth. Set aside to cool slightly. 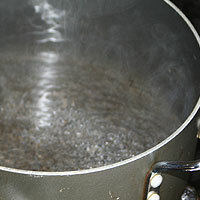 Put an inch or two of water in a large pot. Bring to a boil, then reduce to a simmer. 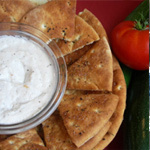 In a large bowl add the egg whites, sugar, cream of tartar, and salt. Whisk well. 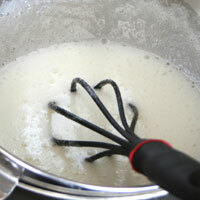 Place over the simmering water and whisk constantly. 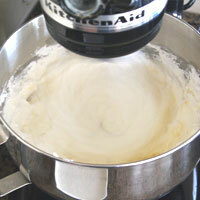 Heat to 160 degrees (about five minutes) The mixture should be doubled in volume and frothy. Remove from heat. Beat on high speed for five minutes until stiff peaks form. Reduce speed to medium and add the butter one piece at a time until each is incorporated. Add the vanilla and beat until incorporated. Divided the buttercream in half. 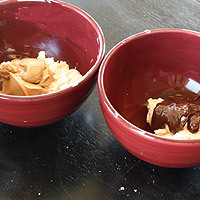 Add the melted chocolate to one of the halves and the peanut butter to the other. Stir both well. 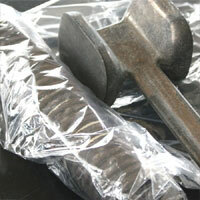 Cover and store at room temperature until ready to use. Chop candy and set aside. 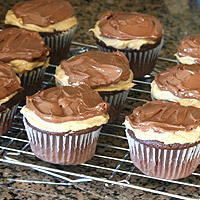 Top with peanut butter buttercream, then chocolate buttercream. 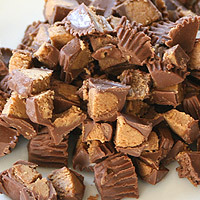 Top with peanut butter cup pieces. 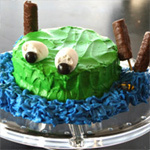 Top with vanilla buttercream. 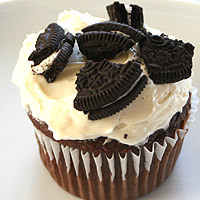 Top with crushed oreos. 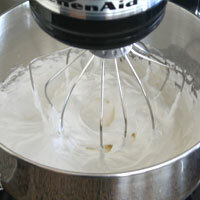 make the buttercream up to the vanilla. Divide it in half. Divide one of the halves into half. 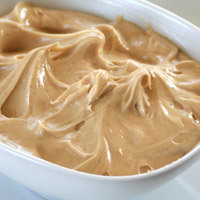 For the smaller halves: add 1/2 c + 2 T (5 oz) peanut butter to one. 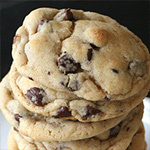 Melt 1 oz unsweetened chocolate and 1/3 c (3 oz) semisweet chocolate. Add it to the other. 1. You will need the most vanilla buttercream because only 1/2 c powdered sugar is added to it. 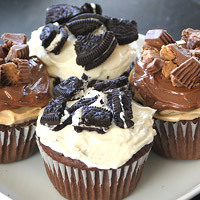 The peanut butter adds more volume to the buttercream, so you'll end up with close to the same amount. 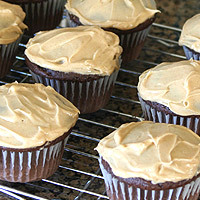 Very little chocolate buttercream is needed as it is only used on the top of the peanut butter buttercream.